I started a new job last month. At my previous job, I had no problem with bringing my lunch every day to work. My co-workers were all the brown-bagging type, and nobody really took a proper lunch break. Furthermore, my office was not near any sort of restaurant or café, thereby eliminating the accessibility of food out, as well as my craving for it. The only food nearby was at the cafeteria, which lacked any sort of allure because their menu was so limited and meat based. When we didn’t have leftovers, I would bring a sandwich or some other easy-make lunch item so that I didn’t have to venture to the crappy cafeteria for food. At my new job, my co-workers often don’t bring lunch. They’ll order in and send out a mass email asking whether I want in on the take-out. We take hour long lunch breaks, which are unpaid but built into our day, and we keep each other accountable for actually taking them. It’s expected. The worst part, is that my new office is within a three minute walk to over 5 of my favorite fast food restaurants. I’m not talking McDonald’s here, I’m talking Wok Box, Menchies, and various other delicious places. It became so easy for me to brown bag my lunch each day by making it a habit at my last job. Because I switched jobs, I needed to establish the habit again at my new office. If you make a habit to make your lunch in the morning instead of buying it when you are at work, it will become far easier to sacrifice the easy, yet unhealthy restaurant food for cheaper and healthier food from home. Each morning, make it a habit to make your lunch for the day ahead and eat it at work instead of out. Many of us fill up our breaks with sourcing food. You have half an hour during your lunch break, and if you didn’t have a lunch from home, you’ll probably spend most of your break – if not all – finding and eating food. We get used to that and if we don’t have to go get food we often feel like we didn’t have a break. Don’t let brown bagging your lunch cramp your breaks; eat your lunch but make sure to get out and about, if that is what you’re used to. If you still leave the office, you won’t know what you are missing. I know I’m far more likely to buy my lunch if I’m super hungry, even if I’ve already brought my lunch. Hunger brings on cravings, and cravings are the catalyst for a lot of our food spending. If you know you are starving by the time you go get your lunch from your favourite lunch restaurant, eat a snack an hour before you usually start feeling hungry and it will more than likely keep you on track with just eating what you brought. You can’t buy lunch if you have no way to pay for it. If you can’t stay on track with brown bagging your lunch, “forget” your wallet! I’ve used this method of controlling my spending when I really had an issue with my self control before. Just leave your methods of payment at home, safe and sound, and bring your ID. 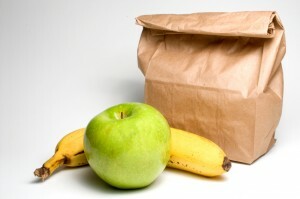 Brown bagging your lunch can save you a significant amount of money every month and it’s far healthier, too. In all seriousness, it’s much easier to spend money on munch when the office culture makes having lunches a “thing”. It’s a lot easier to feel the peer pressure me also convince yourself that it’s “easier” to not pack anything. I hope you can convince your husband to brown bag it more often! I usually cook extra for dinners I really like just so I have leftovers. I think I can count on one hand how many times I haven’t brought my own lunch to work this year. Not only does it save money, but it saves time too when I don’t have to go hunting for lunch at work! That’s great Brock! Keep it up, it saves a lot of money! I brought my lunch to work for 6 years and probably saved a ton for doing so. I work at home now and probably save even more since I no longer have to buy convenience foods to take with me. Oh most definitely you saved a ton. Being self employed probably helps too. Maybe 10 other people on my office campus of 800 regularly bring their lunches. I am one of the 10. I’ve done it every day since I’ve started with absolutely no desire to drive to a restaurant for a mediocre $10 lunch. Wow, you are definitely the minority! Good work. Like you said in the last sentence, bringing your own lunch is far healthier. I definitely eat out regularly, but not every day. I like knowing what is in my food. Plus, you are saving a lot of packaging by not eating out every day. Exactly with the packaging – it’s far greener to brown bag it. If you feel the need to buy a lunch to fit in with others or those emails make you crave a takeout lunch, maybe go partway. Pack a healthy main dish, and just order a side or dessert to have with everyone else. Or pack healthy sides and snacks, and just get a burger, sandwich, or small meal (maybe half portion if they do that). It will be healthier to have only have one part of your meal come from the restaurant, and cost quite a bit less too, but still let you socialize and feel like a part of the office culture. Good tip! I never thought of that. I’ve been taking lunch to work for so long that the act of making lunch (the night before) is as ingrained as is brushing my teeth before bed. In fact, more often than not, when there are days that I don’t need to make a lunch (work gathering or something), I’ll find myself going and starting anyways! It’s great to make a habit out of it! Taking lunch to work is a great things to do: it saves a lot of money and you can make sure you eat healthier stuff. I started doing it about four years ago when we had debt (it saved me about $50-$60 per week and it’s no big deal to cook more and freeze some stew in a small container – I hate sandwiches, you see). Now we are debt free, I still take my lunch in. I am not a sandwich person either! I work from home so it’s less of a chore for me, but I still find making an extra portion for dinner leaves me with a great quick lunch the next day: it’s more about convenience than saving money for me. It’s nice to work from home because you also avoid that tempting office lunch out! When I was losing the 50 pounds I had to lose to join the Air Force, I had to eat healthy. Yet…I worked at Domino’s, which made that difficult. I finally got the discipline to bring my lunch everyday. 6 meals in 6 different containers. It was all about organizing and planning for me. If I got all my meals together the night before I went to work, I would bring them to work and it would be no problem. But if I didn’t have them ready, pizza it was. Being organized enough to do all of that must have taken some work!